2. Take a generous amount and gently massage for 2-3 minutes in circular motion with fingertips avoiding the eye contour. 3. Rinse thoroughly with water and pat dry. Price- Rs. 99 for 50 gm. This comes in a good-looking red plastic tube with a sturdy cap. I do not like flip-top caps because it gets all messy. 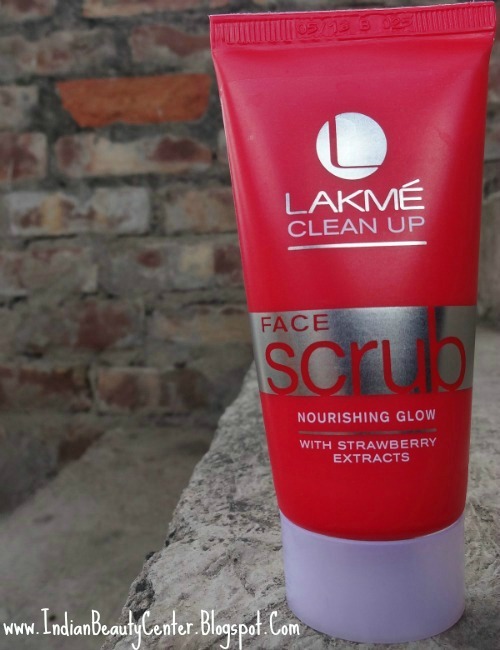 But this Lakme Face Scrub has a twist open cap and so it helps in getting out the product conveniently. The scrub is thick in consistency, where walnut powder acts as an exfoliant. The fragrance is the same as the Lakme Cleanup Face Mask, which has been already reviewed here, but maybe slightly milder. The scrub does not lather much, yet effectively exfoliates and removes all dead skin cells, unclogs pores, removes oil and tightens the skin too! It adds softness and a glow to the face. The softness lasts for 2-3 days. It never gave pimples to my oily, sensitive skin. I just love this scrub totally! But yes, if you have deep-seated blackheads then it won’t help much. For those with milder blackheads, this may work! Finally, I just love the fact that you can get a more intense or even a mild scrub with it. The Scrubbing walnut shell particles are just perfect. If you apply more pressure, the intensity of scrubbing increases. If you want to scrub your face gently then you just need to apply low pressure. You can scrub as per your need. If you want some tough scrubbing, then you can apply more pressure while scrubbing and if you want gentle scrubbing, you can adjust the pressure you apply accordingly. Overall Verdict- This is a great scrub for combination and oily skinned beauties. Does its job perfectly and gives soft and smooth skin. Do not expect it to remove blackheads and all. If you have a sensitive skin then perform a patch test before using it. For me, I loved this scrub! It is a great way to remove all the dead skin cells that get accumulated over the week. Do not over-scrub your skin. Use it only twice a week and not any more. I love your reviews, they are very detailed. nice review arpita...i love the packaging..very nice clicks.